By studying fossilized mollusks from some 3.5 million years ago, UCLA geoscientists and colleagues have been able to construct an ancient climate record that holds clues about the long-term effects of Earth's current levels of atmospheric carbon dioxide, a key contributor to global climate change. Two novel geochemical techniques used to determine the temperature at which the mollusk shells were formed suggest that summertime Arctic temperatures during the early Pliocene epoch (3.5 million to 4 million years ago) may have been a staggering 18 to 28 degrees Fahrenheit warmer than today. And these ancient fossils, harvested from deep within the Arctic Circle, may have once lived in an environment in which the polar ice cap melted completely during the summer months. "Our data from the early Pliocene, when carbon dioxide levels remained close to modern levels for thousands of years, may indicate how warm the planet will eventually become if carbon dioxide levels are stabilized at the current value of 400 parts per million," said Aradhna Tripati, a UCLA assistant professor in the department of Earth and space sciences and the department of atmospheric and oceanic sciences. The results of this study lend support to assertions made by climate modelers that summertime sea ice may be eliminated in the next 50 to 100 years, which would have far-reaching consequences for Earth's climate, she said. The research, federally funded by the National Science Foundation, is scheduled to be published in the April 15 print issue of Earth and Planetary Science Letters, a leading journal in geoscience, and is currently available online. 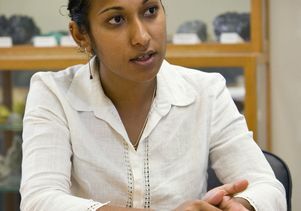 "The Intergovernmental Panel on Climate Change identifies the early Pliocene as the best geological analog for climate change in the 21st century and beyond," said Tripati, who is also a researcher with UCLA's Institute of the Environment and Sustainability and Institute of Geophysics and Planetary Physics. "The climate-modeling community hopes to use the early Pliocene as a benchmark for testing models used for forecasting future climate change." The poles are exhibiting the most warming of any place on the planet, and the effect is most severe in the Arctic, Tripati said. The poles are the first regions on Earth to respond to any global climate change; in some sense, the Arctic serves as the proverbial canary in the coal mine, the first warning sign of fast-approaching danger. Ice sheets and sea ice in polar regions reflect incoming solar radiation to cool the Earth — a phenomenon that makes the poles incredibly sensitive to variations in climate, she said. An increase in Arctic temperatures would not only cause the ice sheets to melt but would also result in the exposed land and ocean absorbing significantly more incoming solar energy and further heating the planet. Without a permanent ice cap in the Arctic, global temperatures in the early Pliocene were 2 to 5 degrees Fahrenheit higher than the current global average. This suggests that the carbon dioxide threshold for maintaining year-round Arctic ice may be well below modern levels, Tripati said. 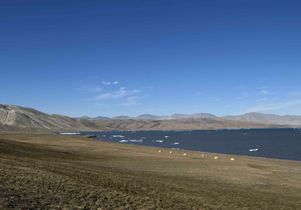 The research was conducted on mollusk fossils collected from Beaver Pond, located in the Strathcona Fiord on Ellesmere Island, at northernmost point of Canada, which is well within the Arctic Circle. Named for the numerous branches discovered with beaver teeth marks that have lasted for millions of years, Beaver Pond has proven to be a treasure trove of fossilized plant and animal specimens that remain remarkably well-preserved within a peat layer encased in ice, Tripati said. Climate scientists typically determine ancient temperatures by analyzing the composition of core samples drilled miles into the ice sheets of Greenland or Antarctica. "Ice cores are a remarkable archive of past climate change because they can give us direct insights into how the poles have responded to variations in past greenhouse gas levels," Tripati said. "However, ice core data is available for only the past 800,000 years, during which carbon dioxide levels were never above 280 to 300 parts per million. To understand environmental change for earlier time periods in Earth's history when carbon dioxide levels were near 400 parts per million, we have to rely on other archives." By measuring the isotopic content of oxygen in a combination of fossilized mollusk and plant samples, it is possible to determine the temperature at which the specimens originally formed, Tripati said. While this method enables climate reconstructions dating back millions of years without the need for ice core samples, it is uncommon to find a site that contains both plant and shell specimens from the same time and place. Additionally, Tripati and her co-authors have pioneered a new method for measuring past temperature using only the calcium carbonate found in fossilized shells. Determining how much of the rarest isotopes of carbon and oxygen are present in the mollusk sample yields results consistent with the original method, which required an associated plant specimen. 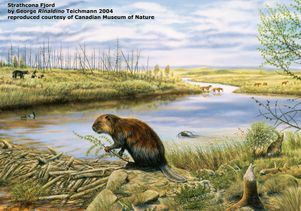 Samples were collected from Beaver Pond by co-author Natalia Rybczynski, a paleobiologist at the Canadian Museum of Nature and adjunct research professor at Carleton University. Adam Csank, a graduate student in the department of geosciences at the University of Arizona, is the first author of the study. Other co-authors include William Patterson, professor of geological sciences at the University of Saskatchewan; Robert Eagle, a postdoctoral scholar at the California Institute of Technology; Ashley Ballantyne, a postdoctoral scholar at the University of Colorado–Boulder; and John Eiler, professor of geological and planetary sciences at the California Institute of Technology. UCLA is California's largest university, with an enrollment of nearly 38,000 undergraduate and graduate students. The UCLA College of Letters and Science and the university's 11 professional schools feature renowned faculty and offer more than 323 degree programs and majors. UCLA is a national and international leader in the breadth and quality of its academic, research, health care, cultural, continuing education and athletic programs. Six alumni and five faculty have been awarded the Nobel Prize.